In the first novel in the series titled Sarah’s Smile, we meet an interesting cast of characters who live in the small town of Riverton, Wisconsin in the early 1900s. We meet the antagonist, Rebecca, whose heart being filled with broken dreams spews ugly words toward Sarah because of Sarah’s heart-breaking past. Now Rebecca is a totally different woman and Sarah is married with a child on the way when Hope comes to the town to put space between her and her former fiancée. Hope is an only child and when her parents travel to a distant land. For her safety, they encourage her to leave New York with very few people knowing her destination. However, after some time has passed, her ex-fiancée shows up at her job to continue the harassment he began in New York. Hope’s dream is to become a designer and see women glow when they feel beautiful wearing her dresses. She desires that women see that they have inward beauty too and carry themselves with more confidence. Ben has a secret and only his family knows what it is and why he won’t let anyone see what he creates. Ben and Hope meet on the train as they are both heading to Riverton and their first encounter isn’t exactly one of laughter or friendship. As I read the book, I really began to imagine the scenes playing out in my mind. The author does such a fantastic job of showing how God, faith and friendship can make a world of difference in a person’s life. Reading how Hope overcomes her fears, past, and begins to understand how God knows best how to fill her life with joy, love and faith, she is then able to rest in His plans. Hope wants the best for all the people whom she encounters and who have embraced her since she moved to Riverton. Here is another example of a story at its best for when a reader is done, he/she is left wanting another tale from the writer perhaps focusing on another character from the town of Riverton. 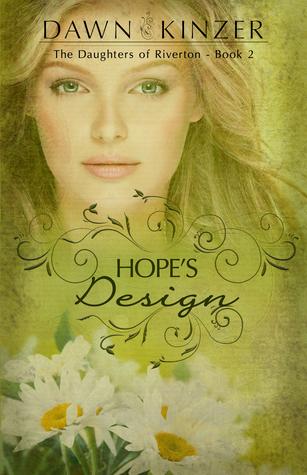 Read and enjoy both Sarah’s Smile and Hope’s Design as they are very enjoyable works of fiction!